NJ Gov. Chris Christie greets PSEG Chairman Ralph Izzo at the groundbreaking ceremony of the PSE&G Solar Farm in Hackensack. Long known as the World’s Medicine Chest and, of course, the agriculturally-rich Garden State, New Jersey is now taking center stage as a national leader in the solar industry. This news is music to the ears of construction companies throughout the region who are bound to see their bottom lines getting blacker as the region goes green. Ralph Izzo, PSEG chairman, president and CEO, joined Gov. Chris Christie on July 31 at the groundbreaking of the PSE&G Hackensack Solar Farm, a renewable energy project that will transform a dormant brownfield into a solar farm. After a lengthy process, J. Fletcher Creamer & Son Inc. of Hackensack N.J. was tapped to be the lead developer of the 1.06-MW PSE&G* Hackensack Solar Farm.Going forward, Izzo said his company expects to invest an additional $883 million to expand its successful Solar 4 All and solar loan programs in New Jersey. “This expansion will create approximately 300 direct (construction) jobs per year over the next five years (and) provide significant business opportunities for our suppliers and advance the state’s Energy Master Plan objectives,” he said. According to Creamer senior estimator Don Smart, the Hackensack site had been cleaned up before ground was broken on the solar field, unlike the conditions at a similar project in Edison last year. Creamer is currently working on a solar project at The Lawrenceville School in Mercer County, just wrapped up a solar project at McGraw-Hill in East Windsor, N.J., and is about to start a third project at Bristol-Myers Squibb in Pennington. While Creamer is at the forefront of solar initiatives in the state, there are many other construction firms also focused on assisting the state in meeting its environmental goals with solar projects. In fact, at the groundbreaking in Hackensack, Gov. 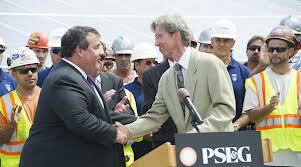 Chris Christie applauded the fact that so many companies here are looking to become involved in helping to convert various brownfields and underutilized properties into solar facilities to meet the state’s electricity needs and advance the state’s Energy Master Plan objectives. The PSE&G Hackensack Solar Farm is the fifth PSEG project that uses renewable energy to breathe new life into a brownfield or landfill. When operations begin there in Q4 2012, it’s expected that the utility company will have “saved” more than 40 acres of vacant brownfield and landfill space by installing more than 40,000 solar panels that will be producing over 10 MWs of solar power. Izzo confirmed that his company is looking to do more of these projects and transform sites like this all over the state to generate more jobs along with clean renewable energy. In addition to the Hackensack and Edison projects, similar installations are in service in Trenton, Linden and Kearny. “Every time we reclaim a landfill or brownfield site with solar panels, it’s a win for the people of New Jersey,” Izzo said. According to the Solar Energy Industries Association (SEIA), the 775 MW of solar energy currently installed in New Jersey ranks the state second in the country for installed solar capacity. In the first quarter of 2012, New Jersey had 174 MW of solar energy installed – more than in any other state in the nation. This marks the first time that any state has ranked higher than California in quarterly solar installations. *Note: PSE&G is the division of parent company PSEG. PSE&G oversees the Solar 4 All and related loan programs. Chris Colabella is the president of CIS Inc., the only local, comprehensive construction lead service in the region. Find out more about CIS, now celebrating its 20th year in business, as well as its flagship products CIS Leads and the C-Source online directory, at http://www.cisleads.com. Or call 973-492-0509 for a more information or a free demonstration on how the products can work for your company. This entry was posted in energy and tagged Creamer, energy, New Jersey, PSEG, solar on March 12, 2013 by Chris Colabella.